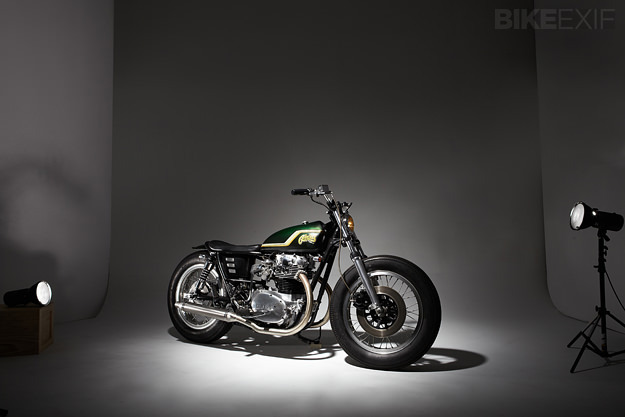 Roughly a year ago we featured a slammed 1982 Yamaha XS650, resplendent in an intricate gold paintjob. It was built by Taipei-based Mark Huang, who still has it and rides it regularly. 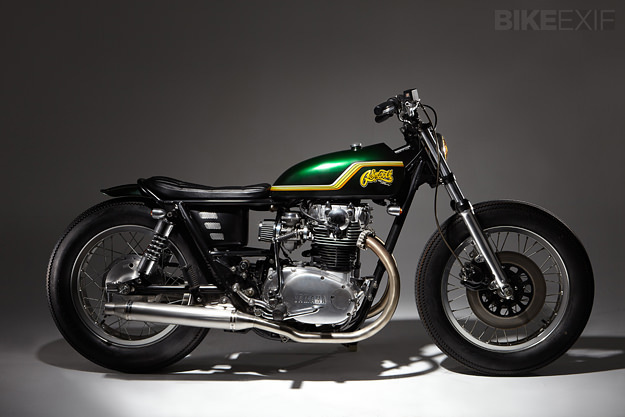 He’s since built another XS650 in the same Japanese street-bobber style—and it looks just as great. It was commissioned by a good customer and friend of Mark’s, Gregory Wu. 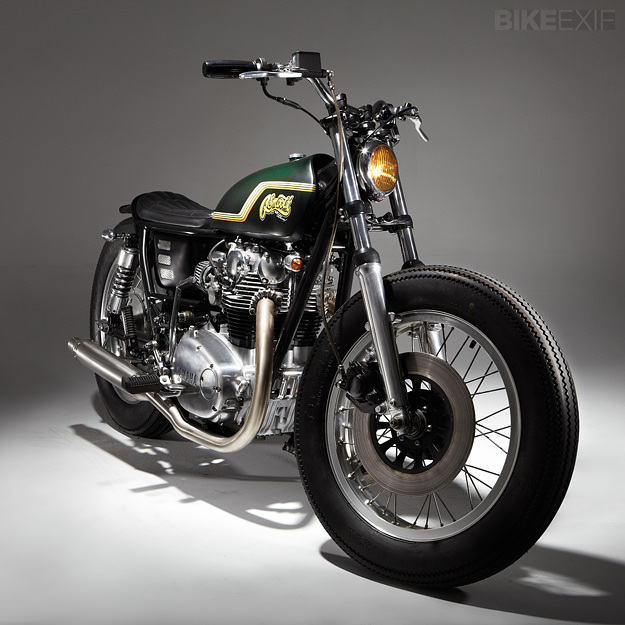 Mark had built an off-the-wall SR400 for Greg back in 2011, but the customized SR wasn’t road legal in Taiwan, making it difficult to ride freely. So, Greg asked Mark to modify another bike for him—less radically this time. Mark started with a 1980-model XS650 that, like his own, had to be sourced from California, as the XS650 is ultra-rare in Taiwan. The two bikes share a few traits—both ride on 11-inch rear shocks, lowered front forks and 18-inch wheels front and back, fitted with Firestone’s Deluxe Champion tires. A similar seat, rear loop and fender were fabricated for Greg’s XS, and the airbox and side covers removed in favor of a beautiful, handcrafted battery box. The exhaust headers and mufflers are also one-off parts. The headlight is from Unity, and a modified ’47 Chevrolet truck taillight has been installed at the back. 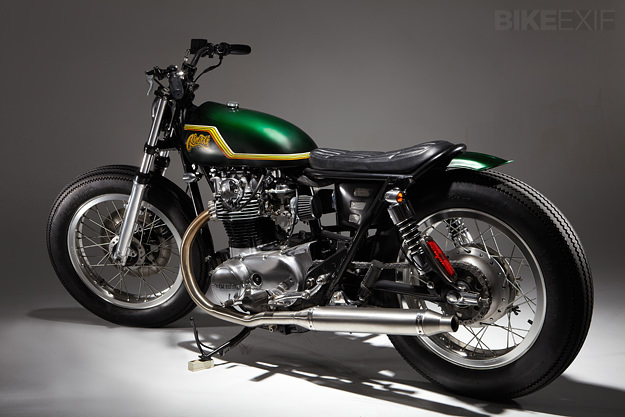 The bike’s most striking feature is its fuel tank—a Yamaha DT250 unit that Mark lengthened by about 4 inches, creating a 1-to-1 ratio with the seat. 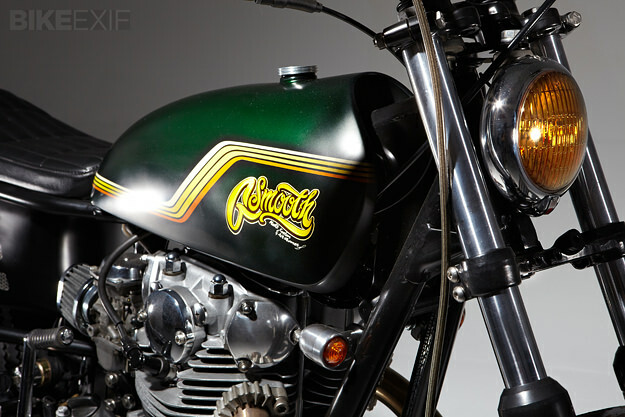 It’s wrapped in a lush green paint scheme by Air Runner Custom Paint, who Mark uses for all his bikes. To be completely honest, slammed bobbers have never been my thing. But with excellent workmanship, clean lines and perfect finishes, Mark has me convinced.